"DC-4" redirects here. For the original aircraft designated "DC-4", see Douglas DC-4E. For other uses, see DC4 (disambiguation). The Douglas DC-4 is a four-engine (piston) propeller-driven airliner developed by the Douglas Aircraft Company. Military versions of the plane, the C-54 and R5D, served during World War II, in the Berlin Airlift and into the 1960s. From 1945, many civil airlines operated the DC-4 worldwide. The Douglas C-54 Skymaster is a four-engined transport aircraft used by the United States Army Air Forces in World War II and the Korean War. Like the Douglas C-47 Skytrain derived from the DC-3, the C-54 Skymaster was derived from a civilian airliner, the Douglas DC-4. Besides transport of cargo, the C-54 also carried presidents, prime ministers, and military staff. Dozens of variants of the C-54 were employed in a wide variety of non-combat roles such as air-sea rescue, scientific and military research, and missile tracking and recovery. During the Berlin Airlift it hauled coal and food supplies to West Berlin. After the Korean War it continued to be used for military and civilian uses by more than 30 countries. It was one of the first aircraft to carry the President of the United States. Following proving flights by United Airlines of the DC-4E it became obvious that the 52-seat airliner was too large to operate economically and the partner airlines [lower-alpha 1] recommended a long list of changes required to the design. Douglas took the new requirement and produced a new design, the DC-4A, with a simpler unpressurised fuselage, R-2000 Twin Wasp engines and a single fin and rudder. United Airlines, Inc., commonly referred to as just United, is a major American airline headquartered in Chicago, Illinois. United operates a large domestic and international route network, with an extensive presence in the Asia-Pacific region. United is a founding member of the Star Alliance, the world's largest airline alliance with a total of 28 member airlines. Regional service is operated by independent carriers under the brand name United Express. United was established by the amalgamation of several airlines in the late 1920s, the oldest of these being Varney Air Lines, which was founded in 1926. The Douglas DC-4E was an American experimental airliner that was developed before World War II. The DC-4E never entered production due to being superseded by an entirely new design, the Douglas DC-4/C-54, which proved very successful. Many DC-4E design features found their way into the Japanese Nakajima G5N bomber. With the entry of the United States into World War II, in December 1941 the War Department took over the provision orders for the airlines and allocated them to the United States Army Air Forces with the designation C-54 Skymaster. The first C-54 flew from Clover Field in Santa Monica, California on 14 February 1942. To meet military requirements the first production aircraft had four additional auxiliary fuel tanks in the main cabin which reduced the passenger seats to 26. The following batch of aircraft were designated C-54A and were built with a stronger floor, cargo door with a hoist and winch. The first C-54A was delivered in February 1943. With the introduction of the C-54B in March 1944, the outer wings were changed to hold integral fuel tanks allowing two of the cabin tanks to be removed; this allowed 49 seats (or 16 stretchers) to be fitted. The C-54C was a hybrid for Presidential use, it had a C-54A fuselage with four cabin fuel tanks and the C-54B wings with built-in tanks to achieve maximum range. The most common variant was the C-54D, which entered service in August 1944, a C-54B with more powerful R-2000-11 engines. With the C-54E the last two cabin fuel tanks were moved to the wings which allowed more freight or 44 passenger seats. A total of 1,163 C-54/R5Ds were built for the United States military between 1942 and January 1946; another 79 DC-4s were built postwar. A variant, equipped to fly over 40% faster, was built in Canada postwar as the Canadair North Star. Buffalo Airways is a family-run airline based in Yellowknife, Northwest Territories, Canada, established in 1970. Buffalo Airways was launched by Bob Gauchie and later sold to one of his pilots, Joe McBryan. It operates charter passenger, charter cargo, firefighting, and fuel services, and formerly operated scheduled passenger service. Its main base is at Yellowknife Airport (CYZF). It has two other bases at Hay River/Merlyn Carter Airport (CYHY) and Red Deer Regional Airport (CYQF). The Red Deer base is the main storage and maintenance facility. The airline is also the subject of the History television reality series Ice Pilots NWT. Douglas continued to develop the type during the war in preparation for a return to airline use when peace returned. The type's sales prospects were affected when 500 wartime ex military C-54s and R5Ds came onto the civil market, many being converted to DC-4 standard by Douglas. DC-4s were a favorite of charter airlines such as Great Lakes Airlines, North American Airlines, Universal Airlines and Transocean Airlines. In the 1950s Transocean (Oakland, California) was the largest civil C-54/DC-4 operator. Great Lakes Airlines was an American regional airline operating domestic scheduled and charter services. Corporate headquarters were in Cheyenne, Wyoming, with a hub at Denver International Airport. North American Airlines, Inc., was an American airline with its headquarters at the HLH Building in Peachtree City, Georgia in Greater Atlanta, USA. Prior to May 2008, it operated scheduled international services from the USA to Africa and Guyana. Later it operated domestic and international charter services and wet lease services. Its main aircraft and maintenance base was Tampa International Airport. Universal Airlines was a United States airline that operated from 1966 to 1972, based at Willow Run Airport in Ypsilanti, Michigan. It initially grew out of Zantop Air Transport, starting with a small fleet of C-46, DC-6, DC-7, and Argosy AW650 aircraft. Over time Lockheed Electras were added to the fleet. In 1969 Universal took delivery of DC-8 aircraft both standard and stretched versions, and leased three additional DC-8s over the next three years. It operated a number of military contract flights. During its heyday in 1969, Universal Airlines looked into the plausibility of obtaining the Lockheed L-500 to carry passengers and their vehicles from coast to coast. An actual display model of that concept was displayed in the hangar two lobby. The airline went bankrupt in May 1972 and its assets were received by Saturn Airways. Aerolíneas Argentinas DC-4 starting engines at Buenos Aires international airport, ca. 1958. Douglas produced 79 new-build DC-4s between January 1946 and August 9, 1947, the last example being delivered to South African Airways (8). Pressurization was an option, but all civil DC-4s (and C-54s) were built un-pressurized. A total of 330 DC-4s and C-54s were used in the Berlin Airlift, which made them the most used types. Purchasers of new-build DC-4s included Pan American Airways, National Airlines, Northwest Airlines and Western Airlines in the USA, and KLM Royal Dutch Air Lines, Scandinavian Airlines System, Iberia Airlines of Spain, Swissair, Air France, Sabena Belgian World Airlines, Cubana de Aviación, Avianca, Aerolíneas Argentinas, Aeropostal of Venezuela (1946) and South African Airways overseas. Several airlines used new-build DC-4s to start scheduled transatlantic flights between Latin America and Europe. Among the earliest were Aerolíneas Argentinas (1946), Aeropostal of Venezuela (1946), Iberia Airlines of Spain (1946), and Cubana de Aviación (1948). Canadian production of a Rolls-Royce Merlin – powered variant, plus a single Pratt & Whitney R-2800 – powered aircraft. British cargo and car ferry adaptation. The Douglas DC-4 Skymaster is depicted on this 1946 U.S. Airmail stamp. The DC-4 was used extensively for airmail service. Very few DC-4s remain in service today. The last two passenger DC-4s operating worldwide are based in Johannesburg, South Africa. They fly with old South African Airways (SAA) colors. They are ZS-AUB "Outeniqua" and ZS-BMH "Lebombo" and are owned by the South African Airways Museum Society   and operated by Skyclass Aviation,  a company specializing in classic and VIP charters to exotic destinations in Africa. The Convair 990 Coronado is an American narrow-body four-engined jet airliner produced by the Convair division of General Dynamics, a stretched version of their earlier Convair 880 produced in response to a request from American Airlines. The 990 was lengthened by 10 ft (3.0 m), which increased the number of passengers from between 88 and 110 in the 880 to between 96 and 121 in the 990. This was still fewer passengers than the contemporary Boeing 707 or Douglas DC-8, although the 990 was 25–35 mph (40–56 km/h) faster than either in cruise. The Aviation Traders ATL-98 Carvair was a large transport aircraft powered by four radial engines. It was a Douglas DC-4-based air ferry conversion developed by Freddie Laker's Aviation Traders (Engineering) Limited (ATL), with a capacity generally of 22 passengers in a rear cabin, and five cars loaded in at the front. The Bristol Type 175 Britannia was a British medium-to-long-range airliner built by the Bristol Aeroplane Company in 1952 to fly across the British Empire. During development two prototypes were lost and the turboprop engines proved susceptible to inlet icing, which delayed entry into service while solutions were sought. The Douglas DC-7 is a transport aircraft built by the Douglas Aircraft Company from 1953 to 1958. It was the last major piston engine-powered transport made by Douglas, being developed shortly after the earliest jet airliner—the de Havilland Comet—entered service and only a few years before the jet-powered Douglas DC-8 first flew. Like other aircraft in Douglas's collection of propeller-driven aircraft, examples remain in service in the present day, albeit in significantly lower numbers than the far more successful DC-3 and DC-6. The Lavochkin La-11 was an early post-World War II Soviet long-range piston-engined fighter aircraft. The Douglas C-74 Globemaster was a United States heavy-lift cargo aircraft built by the Douglas Aircraft Company in Long Beach, California. The aircraft was developed after the Japanese attack on Pearl Harbor. The long distances across the Atlantic and, especially, Pacific oceans to combat areas indicated a need for a transoceanic heavy-lift military transport aircraft. Douglas Aircraft Company responded in 1942 with a giant four-engined design. Development and production modifications issues with the aircraft caused the first flight to be delayed until 5 September 1945, and production was limited to 14 aircraft when the production contract was canceled following V-J Day. The Canadair CL-44 was a Canadian turboprop airliner and cargo aircraft based on the Bristol Britannia that was developed and produced by Canadair in the late 1950s and early 1960s. Although innovative, only a small number of the aircraft were produced for the Royal Canadian Air Force (RCAF), and for commercial operators worldwide. The Convair CV-240 is an American airliner that Convair manufactured from 1947 to 1954, initially as a possible replacement for the ubiquitous Douglas DC-3. Featuring a more modern design with cabin pressurization, the 240 series made some inroads as a commercial airliner, and had a long development cycle that produced various civil and military variants. Though reduced in numbers by attrition, various forms of the "Convairliners" continue to fly in the 21st century. The Aérospatiale N 262 is a French twin-turboprop high-wing airliner built first by Nord Aviation. The aircraft was also known as the Nord 262. The Martin 2-0-2 was an airliner introduced in 1947. The twin piston-engined fixed-wing aircraft was designed and built by the Glenn L. Martin Company. Slick Airways was a cargo airline from the United States, that operated scheduled and chartered flights between 1946 and 1966. The airline was founded by Earl Slick, a Texas aviator and multimillionaire who along with his brother had inherited $25 million dollars after their father's death in 1930. Transmeridian Air Cargo was a British cargo airline that operated from 1962 until 1979 when it merged with IAS Cargo Airlines to form Heavylift Cargo Airlines. 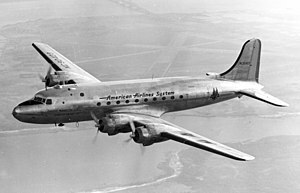 The 1951 Canadian Pacific Douglas DC-4 disappearance occurred on 21 July when a Douglas DC-4 four-engined piston airliner registered CF-CPC of Canadian Pacific Air Lines disappeared on a scheduled flight for the United Nations from Vancouver, Canada, to Tokyo, Japan. Neither the aircraft nor the 31 passengers and six crew have been found. The incident marked the first aircraft loss during the Korean Airlift. The Lockheed L-049 Constellation was the first model of the Lockheed Constellation aircraft line. It entered service as the C-69 military transport aircraft during World War II for the United States Army Air Forces and was the first civilian version after the war. When production ended in 1946 it was replaced by the improved L-649 and L-749 Constellation. 1 2 "History: Products: DC-4/C-54 Skymaster Transport". Boeing . Retrieved 20 January 2015. ↑ Stapleton, Rob (15 August 2009). "Brooks Fuel keeps Alaska supplied using legacy aircraft". Alaska Journal of Commerce. Retrieved 27 February 2017. ↑ Berry 1967, pp. 70–73. ↑ "de havilland | 1960 | 2687 | Flight Archive". Flight. 18 November 1960. Retrieved 28 February 2017. ↑ Blewett 2007, p. 101. ↑ ""Outeniqua" Douglas DC-4 1009 ZS-AUB c/n 42984". South African Airways Museum Society. Retrieved 21 January 2015. ↑ ""Lebombo" Douglas DC-4 1009 ZS-BMH c/n 43157". South African Airways Museum Society. Retrieved 21 January 2015. ↑ "Portfolios: SkyClassic". SkyClass Aviation. 31 March 2014. Retrieved 20 January 2015. ↑ Morgan, Ben. "Engineering Underway on the Douglas DC4". hars.org.au. Archived from the original on 31 January 2012. Retrieved 21 September 2011. ↑ "Buffalo Airways Aircraft Fleet" . Retrieved 17 November 2015. ↑ "Berlin Airlift Historical Foundation" . Retrieved 11 February 2015. ↑ "City: airport's future bright". ↑ "Douglas DC-4 "Oil Bomber" Spray Plane at KCGI". seMissourian.com. Retrieved 9 February 2016. ↑ "N55CW (1942 DOUGLAS C54D-DC owned by AIRCRAFT GUARANTY CORP TRUSTEE) Aircraft Registration ✈ FlightAware". Wikimedia Commons has media related to Douglas DC-4 .